Mount Saint Awesome - 29: Ants: Allies or Adversaries? 29: Ants: Allies or Adversaries? Hey look! Another comic in color! Is the going to be a regular thing now? I'm not sure. We'll see. So we had an ant problem last week. I guess when it rained all the ants that were perfectly happy living outside wanted to move in with us. Fun fact: ants like cat food almost as much as the cat does! I spent a few days waging war with these tiny foes, but in the end I went nuclear (sprayed them with a big can of something called "ANT KILL" ) and I emerged victorious. Eileen posed a picture of one of the battle sites here. That said, ants are pretty awesome! If it was anybody's kitchen but mine I would have just let them stay so I could watch them work. They stop and communicate with each other every time they pass another ant. There's some pretty cool artificial intelligence research out there based on how ant colonies function as a single intelligent entity. 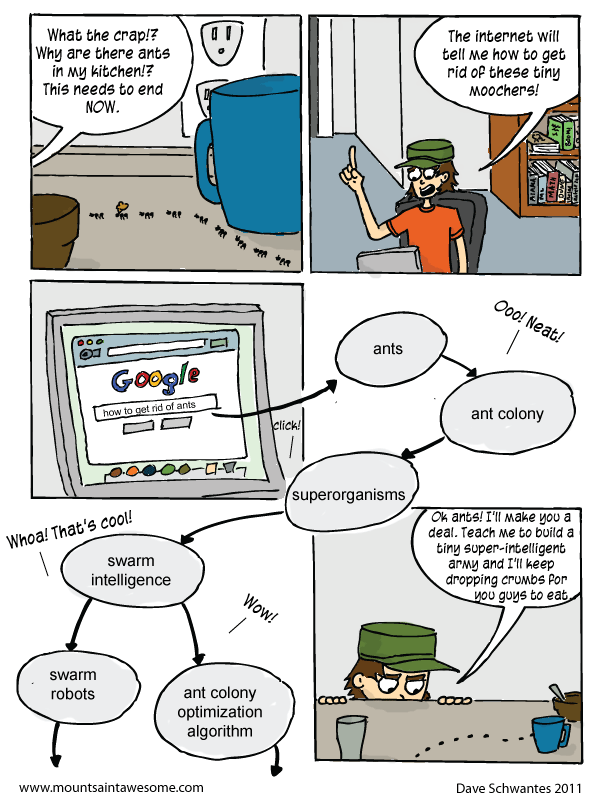 Check out some stuff on swarm intelligence and ant colony algorithms, if you're interested. As always keep voting for Mount Saint Awesome at Top Web Comics, Comics Basement, and Top Web Comics List! Your votes really help! Also... Eileen and I just finished recoding a cover of the Tegan and Sara song "Call It Off". It turned out really well and if you're interested in that sort of thing, you can read about it/listen to it on my blog!